In the Star Wars Rebels Season 1 finale, Fire Across the Galaxy, many fans were shocked to see Star Wars: The Clone Wars character Ahsoka Tano (Ashley Eckstein) make a surprise appearance. Ahsoka will be a regular fixture in Season 2 of Star Wars Rebels, along with a few fan-favorite clones as well, as you can see in a new preview for the upcoming episodes. Executive producer Dave Filoni talks at length about the grizzled soldiers that Ahsoka Tano sent the Ghost crew to look for and who will eventually come into conflict with Kanan -- the fugitive Jedi who watched so many of his friends die at the hands of clone troopers during Order 66. Clone troopers were first introduced in Star Wars: Episode II - Attack of the Clones as highly-skilled combatants that followed any order without questioning its morality. But that has slowly changed over the years, most notably with the character of Captain Rex in Star Wars: The Clone Wars. 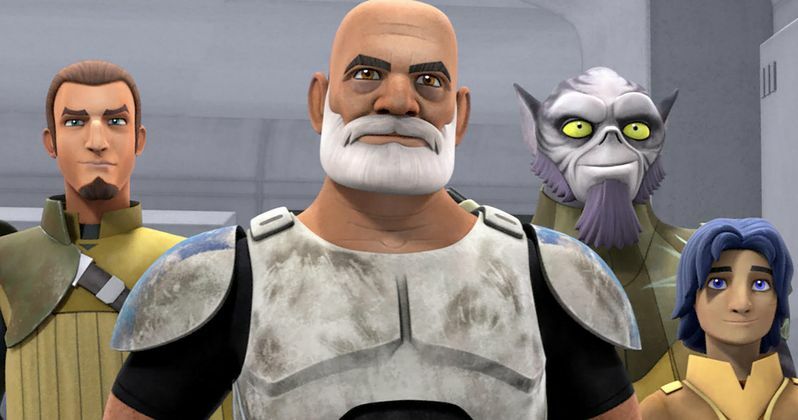 Now everyone's favorite clone is set to make his debut in Star Wars Rebels, and alongside him are two more Republic veterans who also don't exactly see eye-to-eye with the Empire, Captain Gregor and Commander Wolfe. In Star Wars Rebels Season 2, past lives will be revealed and the destiny of our heroes will be changed forever. The transformative new season resumes with Imperial oppression on Lothal growing stronger and the rebels seeking out new allies and additional resources to sustain their fight against the evil Empire. With the help of Ahsoka Tano, the crew of the Ghost enlists some old friends: ex-clone troopers who fought in the Clone Wars. As the rebels grow in number, so do their enemies. New Inquisitors are dispatched by Darth Vader and sent to crush any threat of rebellion. Through dangerous rescue missions, thrilling space chases, and spectacular lightsaber duels - the bond of our rebel crew will be put to the test like never before. This preview also features veteran Star Wars actor Dee Bradley Baker, who discusses the challenge of playing three different characters with conflicting personalities, and what he brought to each voice to make them stand out as individuals. The talented voice cast includes Freddie Prinze Jr. as Kanan, Vanessa Marshall as Hera, Steve Blum as Zeb, Tiya Sircar as Sabine, Taylor Gray as Ezra, Ashley Eckstein as Ahsoka Tano, Dee Bradley Baker as Captain Rex, Captain Gregor and Commander Wolffe and David Oyelowo as Agent Kallus. Sarah Michelle Gellar will also star in Season 2, with more details on her character forthcoming. Check out this new preview to get ready for Star Wars Rebels returning Wednesday, October 14 at 9:30 PM ET on Disney XD.